Fill this adorable bunny with Easter treats for a party favor, special friend, or just to tuck inside an Easter basket. Draw and cut two bunny ears and four paws from felt. Color in the center of the ears with pink marker and make paw lines on each paw. Glue these pieces to the egg in the appropriate places. Cut pieces of floss or yarn for whiskers. Glue these to the bunny face, then glue a pink pom pom over the center of the whiskers for a nose. Glue on a white pom pom tail. 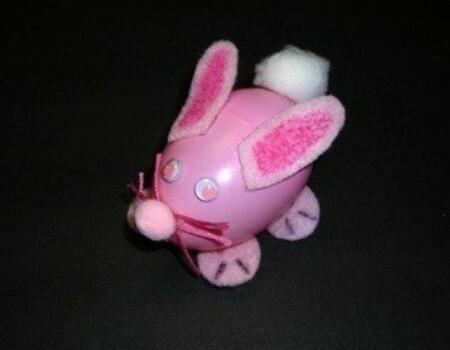 Allow the glue to dry, then fill the egg with jelly beans or other Easter treats. Cute - I think my daughter would enjoy making this. Thanks for sharing!